Lotus Skincare is a division of the multi award-winning Lotus at Siam Thai Day Spa located in Cashmere, Christchurch and is owned and operated by Duncan and Jeerana Laing. Selling the luxurious British ELEMIS skincare to New Zealand, their high standards and extensive business experience, make Lotus Skincare your preferred New Zealand supplier of ELEMIS. Duncan is Christchurch born and in the construction industry owning Laing Technical which specialises in land remediation and reinforcement, as well as being the Managing Director of Lotus at Siam Ltd. 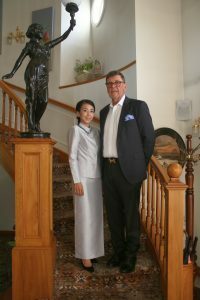 The beautiful Swan Lake Gardens where Lotus at Siam Thai Day Spa and Lotus Skincare is based hold a special place in the Laing family having been in Duncan’s family since 1987. Jeerana, the Spa Director is a fully qualified Thai therapist having trained in Bangkok studying techniques based on strict Buddhist principles. Jeerana has completed to date 13 years of training and practical experience and 18,000 hours of therapy work. Jeerana has also worked at the Intercontinental Hotel in Bangkok for five years which was a professional highlight prior to managing Lotus at Siam. Jeerana works hard with her team to ensure Lotus at Siam Thai Day Spa and Lotus Skincare is truly world-class.